A common question that pops up when we do WordBuild vocabulary workshops around the country is this: How many words are there in the English language? That’s a tough question, and the answer is complicated, if not impossible to determine. You’d think that answering such a question is a matter of counting the words in a reputable dictionary, say the twenty-volume Oxford or Webster’s Unabridged Third New International, each of which defines nearly half a million words. But no printed dictionary, as the editors of those esteemed works will tell you, can possibly contain every word–there is just no space, and the cost to attempt such a thing would be prohibitive, and no one could lift such a thing! Dictionary compilers must make decisions about what to include or exclude–words come and go, they are invented, they are discarded; they are borrowed; they are adapted to new meanings. The English language has been written down and has been evolving for 14 centuries and has distinct varieties all over the earth. A company based in Texas keeps tabs electronically of texts produced in English, and it tallies the number of words as they become used: the latest count is over one million, twenty-five thousand, changing daily. But even that cannot be right! Look at it this way. There is a word for every number, right? Try it. How high can you count aloud? If numbers are, well, infinite, so must words be. You will find seventy-three defined as an entry in the dictionaries, but not six thousand seventy-three. The American Chemical Society identifies over eight million named chemical substances. Biologists tell us that there are a million species of insects, all with distinct names. Exotic food names keep popping up into English all the time. 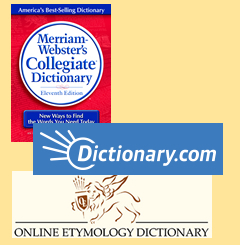 Specialized dictionaries define thousands of words you won’t find in commercial standard dictionaries. Two of my favorites are Dorland’s great dictionary of medical terms, and Mrs. Byrne’s Dictionary of Unusual, Obscure, and Preposterous Words. Here’s another way to look at the difficulty. Take the word run. Easy enough. But there are also runs, running, rerun, reruns, runoff, runner, runners, and you will think of many, many more as you try to fall asleep tonight. You can run down the street or you can run down your shoes. The flu or overwork might make you look run-down, or the boss may ask for a rundown on the latest sales. Are run down (2 separate usages), run-down, and rundown different words? It’s not worth an argumentative run-in with anyone! Just enjoy the myriads of possibilities of English. This is a student video from WordBuildOnLine Foundations Level 1.